I think tomorrow I go off the cell phone internet grid for a couple of days. 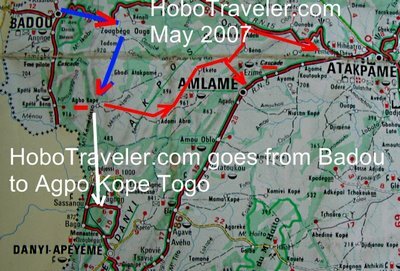 I am going to leave Badou, and go East towards Atakpame to the village of Zoubega Ouga with a Moto, I think the cost is 700 CFA or about 1.50 U.S. Dollars. When I get to Zoubega, I will turn right, or South, from there I am guessing, the moto should or will cost about 1500 CFA, but who knows until I enter the fray. There is supposed to be Auberge or Passage de Chambre called Chez Momo there, all information is dodgy, and assuming. I will do this by Moto or Motorcycle Taxi. It will be easy to travel to Zoubega, then going South I hope to keep the driver going slow enough to enjoy the trip and travel slow in the ruts. No price, everyone assume I have a car or bike, just says the road is ok, and paints a pretty picture, I wish life was a lovely as a picture. I wonder what the elevation is and do they have electricity. I can see that most cities here about 250-300 Meter high, this is not cooking hot by any means, but the rain helps. It is raining a little more, but not really enough to lose the fan. 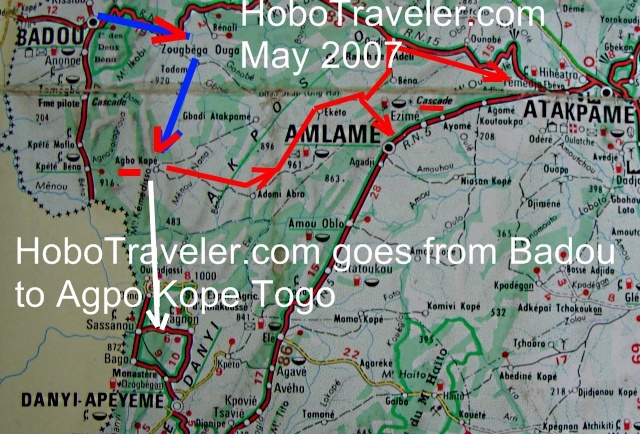 There - STOP- THREE men came to the door, and started SCREAMING at me, I am now in Atakpame, Togo, plans changed again, oops. Everything is Great, I am fine and safe in a new location.